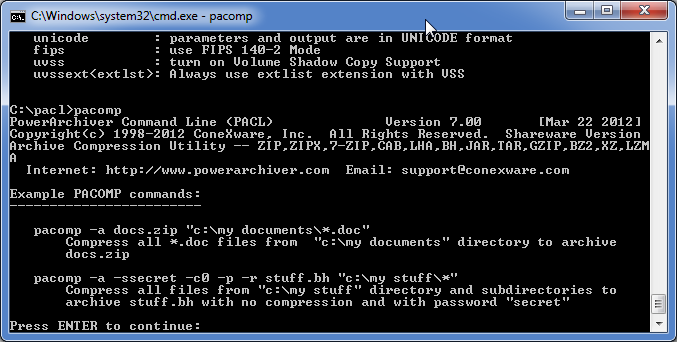 PowerArchiver Command Line is a Windows console utility for working with archives. It features full built-in support for creating ZIP, CAB, LHA (LZH) and BH (BlakHole) archives. It also has full built-in support for extracting ZIP, RAR, ARJ, ACE, CAB, LHA (LZH), TAR, GZIP, BH, ZOO, ARC, XXE and UUE archives. Download the full version of PowerArchiver here. Seems like a fine tool. However, RAR provides a great command line edition too, and I'm not sure what advantages this offers over that. Of course, there is 7z too, but RAR is arguably more mature (though 7z close on its heals). This fixed a problem I was having with the extraction program. If you were missing a piece of a mulipart archive, and you used the -t option to verify it, it would hang, and not ask for the next part. Another reported problem was that keeping the entire path would prepend a \, which would cause problems on extraction. This software itn't bad works well. but it's really slow on my computer. Very handy tool when you need to compress files and don't want to deal with a graphical user interface. Those interested in scripting compressions should also check out PowerArchiver 7.0's auto-backup tool, which is great for scheduling automatic compression for backups and whatnot. best command line compression utility!